Apple’s new iPhone X, iPhone 8, and iPhone 8 Plus are the first iPhones ever to include wireless charging, which is by far the most convenient way to refuel your smartphone. Wireless charging is also much slower than wired charging though, especially since Apple’s new iPhone lineup doesn’t support the fastest available wireless charging standard. The latest iPhones also supposed wired fast charging though, and that’s definitely the way to go if you want to power up your phone as quickly as possible. You’ll need a 30W wall adapter and a USB-C to Lightning cable though, and you’ll pay $74 if you buy them from Apple. If you get the UGREEN USB Type-C 30W Wall Charger along with Apple’s USB-C to Lightning Cable though, you’ll only spend $41 total. 30W USB C Power Delivery Charging: The UGREEN 30W(5V/3A, 9V/2A, 15V/2A or 20V/1.5A) USB‑C Power Adapter is equipped with advanced PD technology and provides fast charging for any of your USB Type C-enabled device(USB C cable or lightning to usb c cable is not included ). We suggest pairing it with devices that support Power Delivery function for maximum charging performance. Your iPhone 8, iPhone 8 Plus, or iPhone X could be fully charged in 100 minutes, and 12″ Macbook in 2 hours. 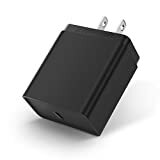 Broad Compatibility with PD and QC Fast Charging Supported Devices: This USB C Charger works for iPhone X, iPhone 8/8 Plus, 2017/2016 MacBook 12 inch, New 2017 Nintendo Switch, Google Chromebook Pixel 2015, Nexus 6P 5X, Google Pixel 2/2 XL, Samsung Galaxy S8/S8 Plus, Samsung Chromebook Plus, Microsoft Lumia 950/950 XL, Moto Z, One Plus 2 Cell Phone. Important Note: For Nintendo Switch, please only use this charger to charge the console directly. Charging through the dock is NOT supported. Manufacturer Warranty: UGREEN USB C Wall Charger is backed with 18 months warranty and lifetime customer service support.